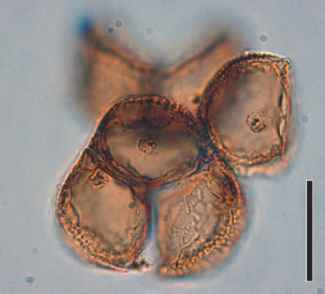 FIGURE 1.13 Compression specimen of Osmunda claytoniites from the Triassic of Antarctica. Bar = 2 cm. 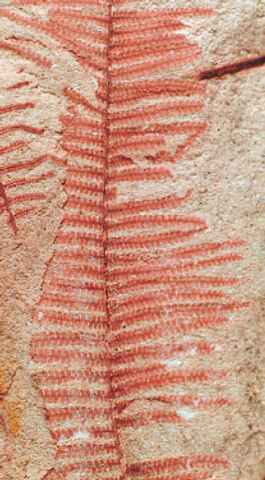 FIGURE 1.14 Portion of compressed fern frond (Cretaceous). Bar = 2 cm. of variously sized pebbles), but generally, compressed plants will be better preserved in clays or shales than in sandstone deposits. Compressions are not always formed in deltaic and fluvial (river) systems; they may be formed in lagoons, along meandering rivers (not necessarily near deltas), and in ponds, swamps, or other depositional systems, as well as in wind-blown sediments. Most often a terrestrial ecosystem is involved (as opposed to a marine environment), although there are instances in which terrestrial plants are even preserved in marine limestones. 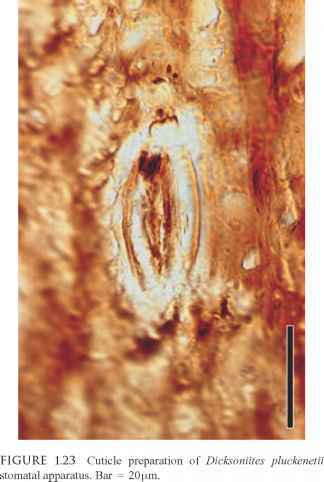 FIGURE 1.15 Portion of a fern frond preserved in tuff from Argentina (Cretaceous). Bar = 2cm. 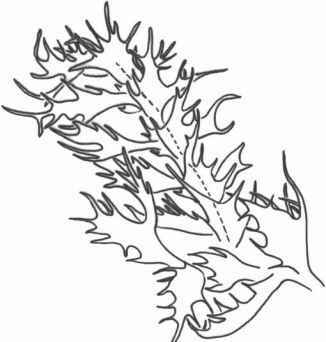 southern Patagonia, the tuff deposits were laid down so rapidly that it is possible to trace the fern Gleichenites vertically from the rhizome through the sediments to the leaves (FIG. 1.15) (Archangelsky, 2003). So well preserved are some of the compressions from this site that the plant material can be sectioned and examined with the transmission electron microscope (Archangelsky and Villar de Seoane, 2004). Fossil cytoplasm has even been described in one unusual compression specimen (Hall, 1971) (FIG. 1.16). A very unusual kind of matrix in which compressions occasionally occur is diatomite—a rock formed from the siliceous shells (frustules) of diatoms (Bacillariophyceae; see Chapter 4), which today inhabit both fresh water and marine sites. Diatomite is especially fine grained and preservation of plant remains in it is often superb. Since the diatom frustules are actually the cell walls of these microscopic algae, in this method of preservation one organism is serving as the preserving matrix for another organism. Leaves are some of the most common plant parts preserved as compressions (FIG. 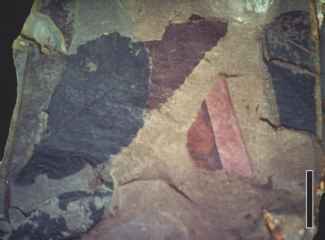 1.13) and, in many instances, they occur in numerous, closely spaced layers within the rock matrix. Often a collector can uncover the leaves by splitting the rock along bedding planes with a knife (if the matrix is clay) or with a hammer and chisel (if the rock is harder), although sometimes the paleobotanist must resort to more energetic measures to uncover fossils, such as using a jackhammer or even dynamite! FIGURE 1.17 Compression of pinnae in which only the axes and pinnule venation are preserved (Pennsylvanian). Bar = 1 cm. a petiole (leaf stalk), leaf margin, trichomes, and the pattern of venation (FIGS. 1.17, 1.18) are generally readily discernible. In some cases it is possible to examine the distribution of stomata in the leaf surface. When there is an abundance of leaves presumably from one species of plant, it is possible to determine the degree of variability exhibited. In other cases this is far more difficult, especially as leaves tend to be the most plastic in their morphology of any plant part. For example, it is often difficult to find two leaves that are morphologically identical on some modern plants, such as the common mulberry tree (Morus spp.). Many conifers (Chapter 21) produce juvenile leaves with a different morphology than that of mature leaves. When found as fossils, these may have been described as two different species. For these reasons, paleobotanists must be extraordinary sleuths in uncovering features that will help distinguish variability within a single species (intraspecific variability) from differing leaf forms that reflect different species (interspecific variability) or genera. FIGURE 1.18 Cuticle preparation showing venation of Barthelopteris germari pinnule. Bar = 1 mm. (polarized light sources together with a polarizing filter over the camera lens) can significantly enhance contrast (Schaarschmidt, 1973; Crabb, 2001). Another method that has been used with compressed animal remains uses backscattered electron imaging to help differentiate among superimposed anatomical features compressed into a single plane (Orr et al., 2002). cells and may also extend slightly downward between these cells in flanges which are perpendicular to the surface of the plant. Plant cuticles, as well as waxes deposited on top of the cuticle, are important for the plant in controlling transpiration—the movement of water through the plant, from the roots to its eventual evaporation from the leaves. Most water is lost from stomatal openings, but some can evaporate through the cuticle if it is thin enough or its texture allows for cuticle transpiration. Cuticle is also important in control of gas exchange with the environment, in repelling water from the leaf surface, in attenuation of photosyntheti-cally active radiation (PAR), and in blocking ultraviolet (UV) radiation. The cuticle, especially the leaf cuticle, serves as an interface for a host of biotic interactions between plants and other organisms in their environment, including parasites and herbivores (Riederer and Müller, 2006). Because cuticle is inert and resistant to decay, it is widely preserved in the fossil record, and represents a valuable source of paleobotan-ical information (Mösle et al., 1997). The leaf cuticle is often preserved as an intact envelope which once surrounded the living leaf tissue (FIG. 1.20). Many fossil cuticles are fragile and must be protected prior to transport from the collecting site. One way to do this is to apply a mixture of nitrocellulose to the surface of the fossil (LePage and Basinger, 1993, 1994), thus preventing loss and breakage of specimens as the freshly excavated sediment dries. Common nail polish has also been used in a similar way. Covering the cuticle with a preservative in the field, however, may prevent subsequent geochemical study of the cuticle (Collinson, 1987). 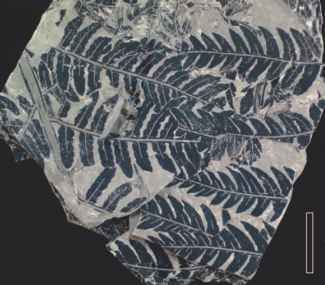 It is possible to remove the cuticle from many fossil leaf specimens either mechanically, with a needle or brush, or chemically by dissolving away the rock matrix. Pieces of cuticle retrieved in this way can then be bleached and stained with common biological stains, such as safranin (Bartholomew et al., 1970; Dilcher, 1974; Kerp and Krings, 1999; Krings, 2000a) (FIG. 1.21). When mounted on a slide and examined under a microscope, the cuticle or cuticular fragments reveal considerable epidermal detail (Kerp, 1990). Cuticles of epidermal cells are apparent (Fig. 1.22), along with the structure of the stomatal complex (the cells associated with the pores, i.e., stomata, in the leaf (Fig. 1.23)), the distribution of stomata, presence of hairs or glands, and other distinguishing features. The cuticle in plants is very much like a fingerprint, in that many species have distinctive epidermal features and patterns that can be useful in identification. Furthermore, it is often possible to demonstrate that disarticulated plant parts, such as leaves, stems, flowers, and seeds, actually belong to the same plant because the individual parts have the same complement of cuticle structures. 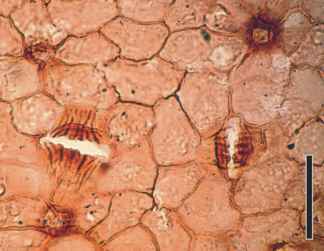 Cuticle and epidermal features can be investigated by transferring the compression fossil from the rock matrix in the form of a transparent film, which can then be examined under a microscope. The film can be made by pouring on a liquid-plastic substance (e.g., clear fingernail polish), letting it dry, and then teasing away the film, with the cuticle adhering to it, from the rock matrix. 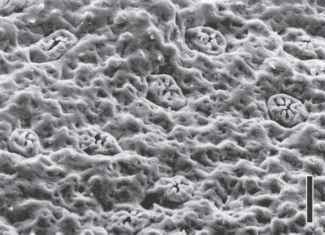 A comparable technique is to embed the surface of the fossil in liquid plastic (such as that used for preparing biological mounts) and then macerating away the rock with an appropriate acid. In some cases, the cuticle can simply be removed from the surface of the rock with a dissecting needle, without the need for transfer film or maceration. Cuticles can also be transferred onto polyester overlays, which reduces the time of preparation and preserves the fossil from which they were taken (Kouwenberg et al., 2006). FIGURE 1.25 Lycospora spore with structures interpreted as possible chromosomes (Pennsylvaman) Bar = 12|im. 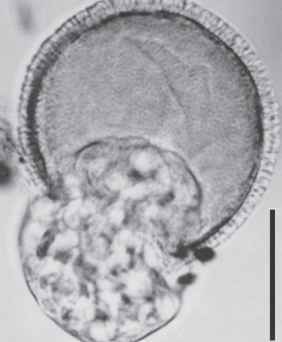 1.26, 10.20) with condensed chromatin, and plasmodesmata, were preserved in these fossils! The possibility always exists, however, that subcellular structures may be contaminants or artifacts formed as a result of the compression and dehydration of other cell components during diagenesis (Niklas, 1982). Chloroplasts have also been reported from Eocene leaves of Metasequoia collected from the Canadian High Arctic (Schoenhut et al., 2004). These authors suggested that the extraordinary preservation may have resulted from high concentrations of tanniniferous cells in the leaves, which may have inhibited microbial degradation and thus left the cell organelles intact. Some compressed Eocene angiosperm leaves from the Geiseltal in Germany and Clarkia beds in Idaho are still green when the rock is split open (FIG. 1.27), which suggests that the chlorophyll is still intact (e.g., Dilcher, 1967). 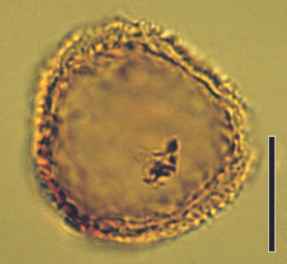 FIGURE 1.26 Tetrad of Flemingites spores showing cell contents interpreted as nuclei (Pennsylvaman). Bar = 20 |im. FIGURE 1.27 Compressed angiosperm leaves from the Clarkia beds with chlorophyll preserved (Miocene). Bar = 3 cm. on this fascinating subject, see the excellent compendium of papers in Krumbein et al. (2003a). Fossil deposits which show a great diversity of organisms preserved, or excellent preservation, or both, are called Lagerstätten (sing. Lagerstätte). Lagerstätten of various ages have provided paleobotanists with a wealth of information on plants of the past (see, e.g., Chapter 6). TEM of fossil cuticles has proved useful in detailing the intricate structural organization of the stomatal complex in certain fossil plants and in understanding preservation processes (Villar de Seoane, 2003). Fossil cuticles have also been examined for their chemical constituents (Tegelaar et al., 1991; Mösle et al., 2002; Gupta et al., 2006). Some cuticles are too thin for standard preparation techniques to be effective, or have been fragmented into minute pieces during fossilization so that they cannot be removed from the rock surface. Under these circumstances, incident light, dark field, or epifluorescence microscopy have been useful in revealing certain cuticle and epidermal characters (Kerp and Krings, 1999; Thomas et al., 2004). Recently, three-dimensional confocal laser scanning microscopy (CLSM) has been added to the arsenal of tools used by paleobotanists to extract information from the fossil record (Schopf et al., 2006). This technique utilizes a sequence of closely spaced images that can provide information in three dimensions. 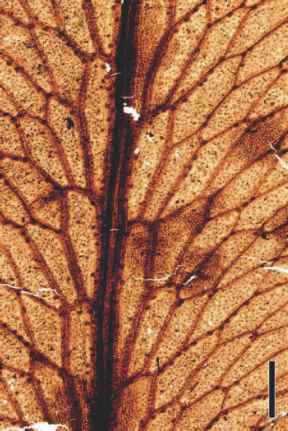 The technique is non-destructive and non-invasive, and has been successfully applied to Precambrian microscopic fossils in order to characterize not only morphology, but the nature of the preservation, including possible cell contents. Because the specimens examined must provide an autofluorescent signal, the fossils cannot have been geochemically altered. 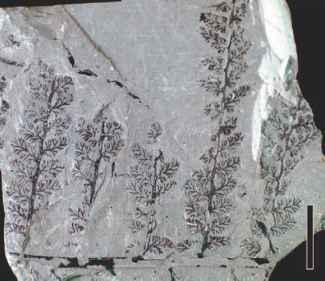 Like many techniques used in paleobotany, the procedure needs to be investigated on a particular fossil and, if the desired information cannot be obtained, the investigator needs to modify the technique or explore another means of obtaining the information needed. Doran (1980) employed a bulk maceration technique to study Devonian compression fossils that were preserved in a silicified tuff matrix. He submerged the rock in hydrofluoric acid (HF) until the fossils were freed from the matrix. This technique provided nearly complete plants, and Doran could thus more accurately reconstruct the complete morphology of the plants. This method is useful because plant axes that extend into the matrix can be totally freed, but it only works on material where enough organic matter is preserved for the plants to remain intact through the maceration process. A more widely used technique to uncover compressed plant parts within the rock matrix is dégagement. This technique was developed primarily by Suzanne Leclercq (1960) and involves removing the rock matrix—often grain by grain— using fine steel needles (FIG. 1.29). FIGURE 1.29 Impression-compression of stem surface of Colpodexylon deatsii (Devonian). Bar = 2 cm. Although X-ray analysis has been used for many years by paleontologists working with animal fossils, historically this technique has been little used for fossil plants (Stürmer and Schaarschmidt, 1980). X-ray analysis has been especially valuable for studying specimens preserved in highly metamorphosed shales where much of the specimen is covered by the matrix and where bedding planes are poor. This technique not only provides details that cannot be obtained with conventional techniques but also makes some three-dimensional reconstructions possible through the use of stereoscopic X-ray analysis. 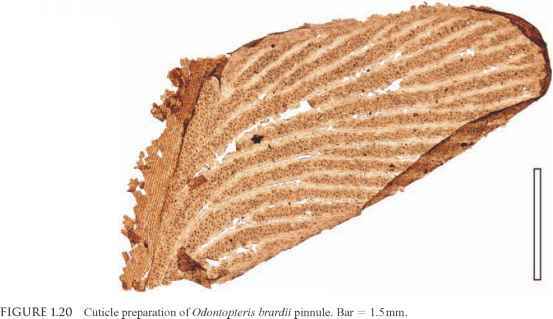 Uncovering the three-dimensional nature of fossil plant parts that are compressed or otherwise encased in the rock matrix is a goal in many paleobotani-cal studies. More recent improvements in the capture and analysis of X-ray images suggest that this technique will be more widely used in paleobotany in the future (Dietrich et al., 2000). X-ray computed tomography (CT) scans have been widely used in medicine, and vertebrate paleontologists have adapted these methods, using high-resolution scans (HRXCT), as a non-destructive method to produce three-dimensional images of vertebrate bones (Conroy and Vannier, 1984). Only recently, however, these methods have been used on fossil plants. Devore et al. (2006) used HRXCT to image the morphology and anatomy of pyritized fruits and seeds from early Eocene London Clay Formation. Because fossils preserved the in pyrite are fragile and deteriorate over time if exposed to air, they are conserved by placing them in sealed tubes of silicon oil. Using HRXCT it is possible to examine the fossils without removing them from the vials, thus decreasing the chances of exposing the specimens to air and subsequent deterioration. This technique makes it possible to study type specimens non-destructively and to reexamine characters that were initially used to define taxa and to evaluate forms for which the taxonomic affinities remain equivocal. It also preserves the integrity of the fossils so that they may be utilized in subsequent studies, perhaps when other, newer techniques are developed (Matysova et al., 2008). 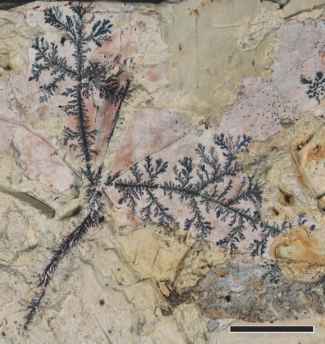 How dendrites in pseudofossil can be created in lab? 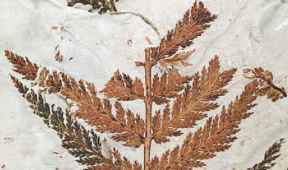 What is compression fossil of plants? What type of fossil where cellular details foun? What is the compressed plants rock?